C. B. Gitty Crafter Supply is a family-owned company dedicated to supplying a range of folks from professional builders and instrument repair professionals to home-crafters and hobbyists with good materials at good prices. Founded in 2008, C. B. Gitty has grown to be the only Cigar Box Guitar Parts General Store and a primary supplier for the homemade/handmade music movement, in addition to offering a wide variety of parts and gear for non cigar-box instruments as well! Wwe have satisfied many thousands of customers so far, and look forward to working with you as well. The motto of our business is simple: Sell unto others as you would have them sell unto you. We never want to send out a product that we would not be happy to receive, if the roles were reversed. We believe that good business is not just about profit and the bottom line, and we believe that it is still possible to be successful in business without abandoning honesty and ethics. The day that is no longer possible is the day we close up shop. Thank you for visiting our site, and we look forward to doing business with you. Ben "Gitty" Baker - Ben sold his first set of fret wire back in December of 2008, and has been at it ever since. Starting from the basement of his house, and now occupying 13,000 square feet of a historic mill building, Ben still wonders how it all came about. Kim Starling - Kim's time at Gitty extends back into the basement days. Her experience in theater and managing a famous playhouse helps her deal with the daily insanity of working with Gitty. She handles the daily order processing and shipping, and in responsible for making sure your orders get out the door quickly! Glenn Watt - Glenn also started back in the fabled basement days of C. B. Gitty, and now plays a key role in the manufacturing side of the business, creating a growing array of the small parts we sell, as well as building many of the cigar box amplifiers, kalimbas and other custom instruments. 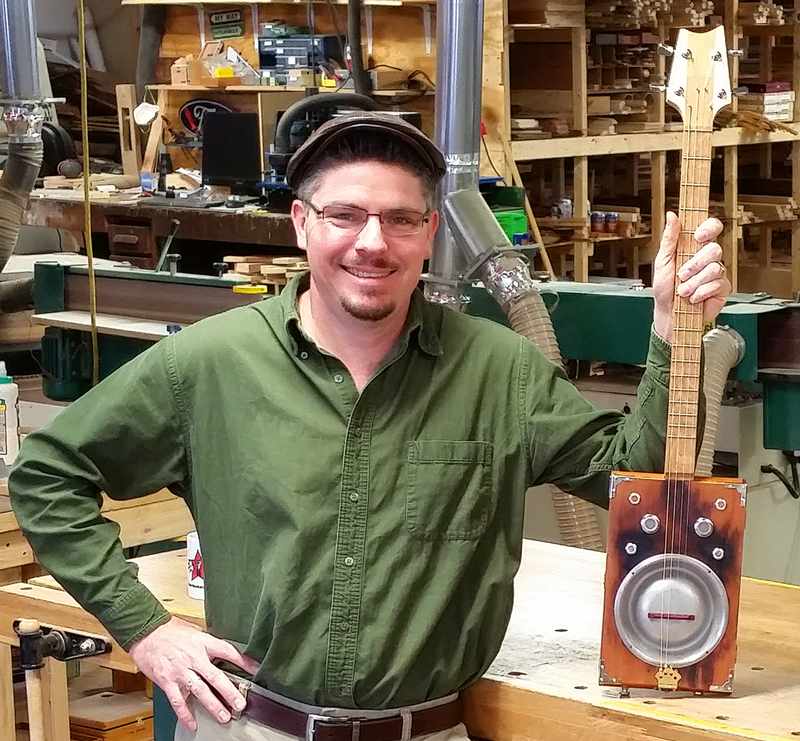 Jason Munoz - Jason was an experienced handyman carpenter before joining C. B. Gitty's team and now is our chief cigar box guitar builder. He also handcrafts the cigar box guitar necks and fretboards we sell, along with our canjos. Dawn Baker - sometimes known as Mrs. Gitty, Dawn is Ben's wife and helps in the order processing and shipping. Laurel Caldwell - Laurel heads up the product packaging department, keeping up with the ever-expanding inventory and wide array of products we carry. Farley Andresen - Farley is an experienced contractor and finish carpenter, who recently joined the Gitty team part time out in the workshop, assisting Glenn and Jason with a wide range of woodworking tasks. Since joining the team, she has rapidly become one of our premier instrument builders, with a focus on custom instruments made from reclaimed barn boards and vintage materials. After rapidly outgrowing the basement of his house and then a 3500 square foot building in Barrington, NH, Gitty decided to move the business to a 24,500 square foot space over two floors of a historic old mill building in Gonic, NH. 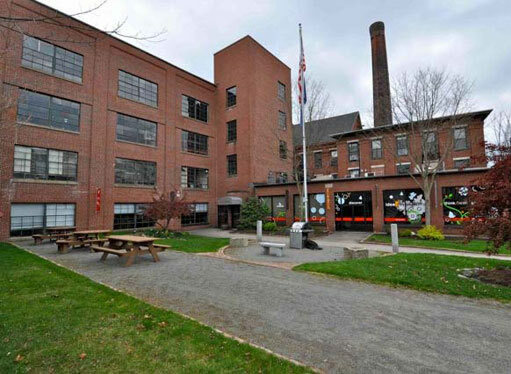 Located on the Cocheco River, the timeworn brickwork of the mill is a perfect home for the business. It just feels right to be making cigar box guitars and other stuff in a building that harkens back to America's great industrial age. Below are some photos of the mill, starting with a historic image showing the original building, and then a more modern day view.